There is a house in Folgate St that is famous for the quality of its silence. As you enter the door, you receive a stern instruction to restrain from speech, which is a strangely liberating experience. Let me admit, much as I love a good chat, I have many times wished that I never had to speak again. So when you seek consolation from the fierce jabbering inconsequentiality of talking, when a gnawing hunger for silence comes upon you, as is not unlikely during the imminent Christmas season, 18 Folgate St is the place to go. I can vouch that the silence there is of a rare and ancient vintage. Just as a good meal requires salt and pepper, silence thrives off peripheral sound. In the absence of talking, your ear becomes attuned so that as you descend the wooden staircase in the candlelit gloom of this fine eighteenth century house, the subtle music of the creaky old boards attends your progress. You find yourself in the kitchen and stand for a moment, listening to the crackle of the fire and the ticking of the clock, in the distance the bells of Christ Church, Spitalfields are pealing. As a writer, I can testify that when you do not speak, your thoughts take flight, and so it is here, as you ascend the winding stairs up and up into the velvety darkness. Without sound, your sense of smell grows keener too, as the fragrances of sweet perfume, tobacco and oranges mingle in the stairwell – compounded by the immense visual detail, it is an intense experience for all your senses. 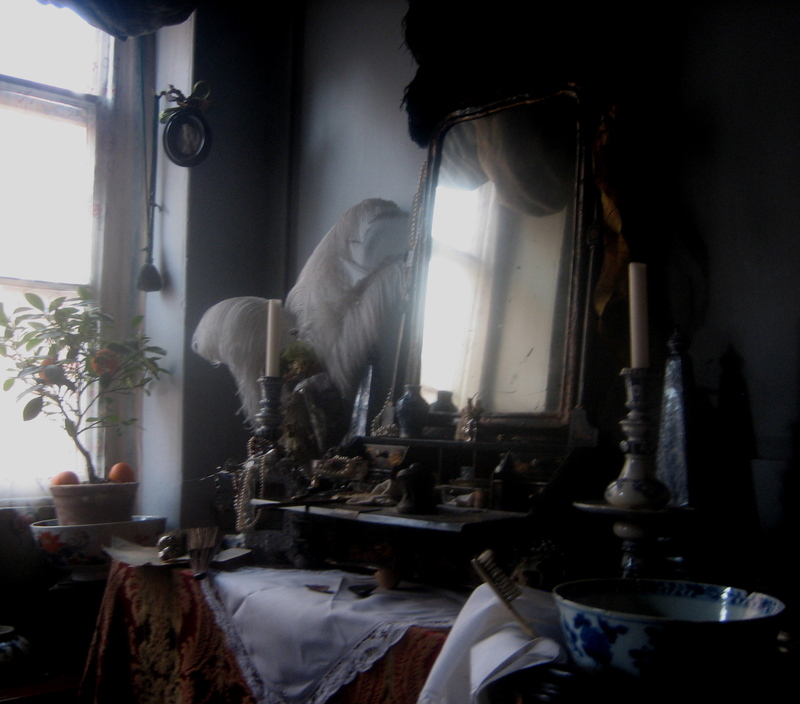 This is Dennis Severs’ house, he created this fantastical environment as his lifetime’s work, his passion and his legacy. For many years, he collected old things from the local markets when no-one else was interested and recreated the furnishings of the house from different periods of its habitation. But this is not a museum, it is an extravagant fantasy. All the paraphenalia here are properties from the drama of the lives of successive generations of the Jervis family, a Spitalfields Huguenot dynasty of silk-weavers spun out of Dennis Severs’ imagination. In each room, you will find evidence that they just left, eggs in a mixing bowl on the kitchen table, an overturned chair in the drawing room, a cup of tea on the dressing table, a glass of wine on the dining table, a rumpled bed in the attic, and so it goes on. 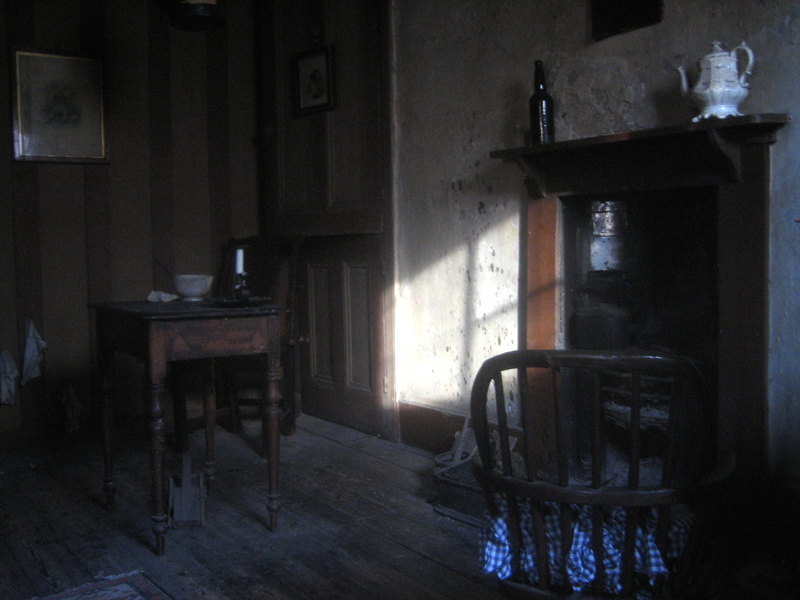 The writers referenced here are Beatrix Potter in the kitchen dresser straight out of “The Tailor Of Gloucester” and Charles Dickens in the attic writing desk and heavily curtained bed from “A Christmas Carol,” but the sensibility is closer to Lawrence Sterne and Lewis Carroll in this house of games and paradoxes. As you walk from the eighteenth century dining room into the nineteenth century parlour your relative sense of time dissolves, so that it is no surprise at all to discover a New York Yankees cap sitting on a chair. Within the all encompassing silence of this house, everything is present tense. Another winning post. I’ve been there in the day but it must be very magical at night.